Engaging effectively and honestly with the social web involves listening a lot more than you speak; reading a lot more than you write. One of the first tools I introduce to clients interested in exploring social media is some form of RSS reader. 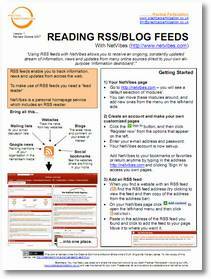 An RSS reader is a tool to agregate conversations and information from across the social web into one place – making it easier to listen as a foundation for engaging. Recently, my reader of choice (for those starting out) has been NetVibes. So, here is the next in my series of one page guides – this time looking at NetVibes. You can download the guide as a PDF here. The guide is Creative Commons licenced, so you are welcome to use it in your own work, and to adapt it (Word copy attached below) to contextualise it for different audiences or groups. For example: In the original copy of this guide I wrote for a client I created a customised NetVibes tab with a range of tools they might find useful and provided a TinyURL link to this as the first step of getting started, instead of pointing people straight to the front page of NetVibes. That way, users could immediately see how NetVibes was relevant to them, instead of first encountering the standard NetVibes modules and tools which are set up for a very different audience. I'd love to hear about any use you make of this guide.